IoT and BYOD increase access points and vulnerabilities in your network. Network Access Control solutions provide you the visibility and control you need. Develop, implement, and enforce security policies for controlling device and user access. Identify and stop threats based on security polices from mobile devices as they attempt to access your network. 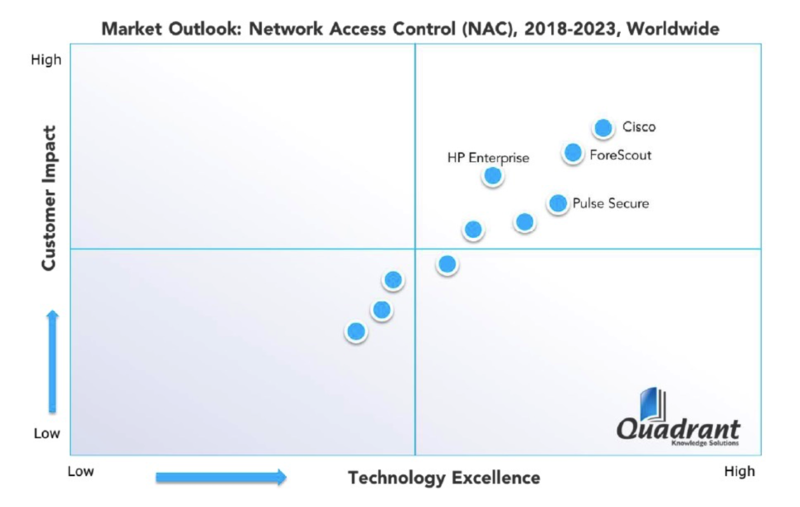 Cisco, ForeScout Technologies, Pulse Secure, and HP Enterprise (Aruba) are positioned as the top 4 overall technology leaders and are the top four top selling enterprise NAC solutions. ForeScout reduces the impact of network-and device-related security breaches to a significant degree and .. provides an additional level of confidence that their most sensitive data will not be exposed through security breaches and that their business operations will not face disruptions from security exposure. ForeScout provides agentless visibility, control and automated security orchestration for devices accessing your network. 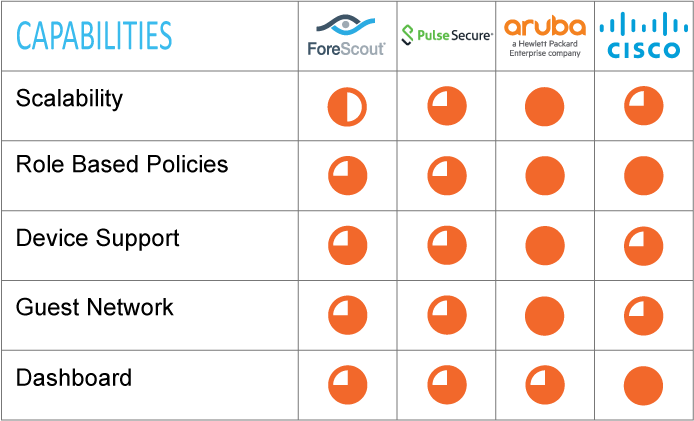 Forescout CounterACT provides real-time discovery, classification, assessment and monitoring of devices, allowing you to see exactly what’s on your network and enforce appropriate, policy-based access controls. Enterprise Manager provides centralized security management for global control of all your CounterACT physical or virtual appliances. Pulse Policy Secure is a mobile-ready NAC solution that offers extensive visibility on the network activity for security and performance. It provides granular context-based role assignments and provisions resource access policies and protects your network by guarding mission critical applications and sensitive data, providing identity-aware network security, and delivering comprehensive NAC management, visibility, and monitoring. Aruba ClearPass (HPE) for Secure Network Access Control provides role- and device-based secure network access control for IoT, BYOD, corporate devices, as well as employees, contractors and guests across any multi vendor wired, wireless and VPN infrastructure that use them. ClearPass provides built-in context-based policy engine, device profiling and comprehensive posture assessment, on-boarding and guest access options. Cisco Identity Services Engine (ISE) simplifies the delivery of consistent, highly secure access control across wired, wireless, and VPN connections. ISE uses intelligent sensors to reach deep into the network to provide superior visibility into who and what are accessing resources. Cisco TrustSec technology enforces role-based access control at the routing, switching, and firewall layer. ISE automatically detects and contains threats through integration with the Cisco Firepower® Management Center and 3rd party security partners.